Endoprosthesis is an artificial mechanical device, implanted within knee, femur, teeth, a facial bone and hollow stent in vessel or tubular structure and other body parts to support the motor control lost by any diseases, body disorders, accidents and congenital defects. There are two types of endoprosthesis cementless and cemented, in younger age patients cementless endoprosthesis is preferred and they have a rough surface compared with other kind. The three kinds of material used in manufacturing of these artificial devices are ceramic, polyethylene and alloy metal. Knee and hip replacements are the major surgeries being undertaken. 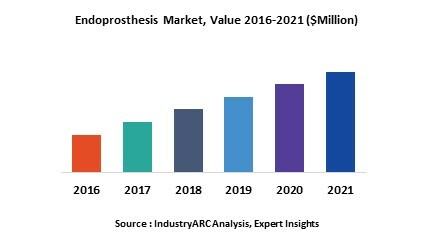 Endoprosthesis market is expected to exhibit a significant growth in near future due to advancement in treatment, growing awareness for prosthetics in orthopedic injuries, increasing frequency of peripheral vascular diseases and orthopedic disorders. Knee and hip osteoarthritis prevalence is rising at rapid rate due to increase in number of higher age group population. However, in low and middle income countries have limited affordability and lack of healthcare coverage besides cultural hurdles. Endoprosthesis market has vast growth potential in terms of revenue aggravated by growing demand. This report provides information on endoprosthesis market size for the year 2014-2016, and forecast of the same for year 2021. It also focuses on market drivers, challenges, restraints, market dynamics, growth indicators, competitive landscape, potential growth opportunities and other key aspects with respect to endoprosthesis solution market. United States and Europe remain the potential market for endoprosthesis. Old age population in these countries is comparatively high coupled with the adoption of endoprosthesis. Awareness and insurance coverage among people are driving the market growth in these nations. India, China and few other countries in Asia Pacific region are slow growing markets for endoprosthesis due to issues like affordability, lack of insurance coverage and no support from government on regulations thus making the market to be dominated by few major players. 9.1. Zimmer Biomet Holdings Inc.
9.2. Smith & Nephew Plc. 9.5. Wright Medical Technology Inc.